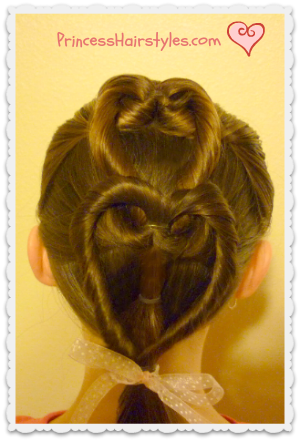 A double heart Valentine's day hairstyle! Hey guys! We wanted to get one more heart hairstyle in before Valentine's Day and decided to do a video on one of the very first heart braids that we posted for Valentine's Day back in 2009 (before we started doing video tutorials.) In the original style, the hearts lay diagonal on her head and we braided the hearts instead of twisting them like we did here. But, the concept is basically the same. We have used hearts to make a "French Braid" look, which is why we have named this one the "heart French braid!" As you can see, we created 2 hearts, and ended the style in a ponytail. Of course, you can make as many hearts as you want to. If you make the sections smaller, you should be able to fit in a few more before you run out of space on her head. This style could also be finished with a bun or braid instead of a ponytail. Whatever you prefer. 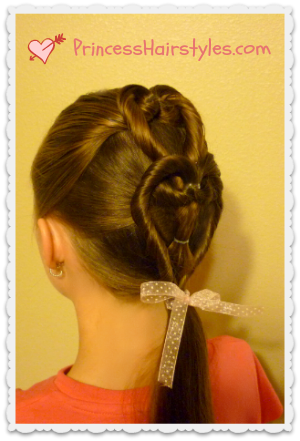 I'm thinking this hairstyle would be cute for Valentine's Day, or for a flower girl at a wedding. Love this one! I have never left a comment but we love your blog. My 4 year old loves her hair done and loves to check the "princess website" for new ideas. Cant wait till hers is longer and thicker (we all have curly hair too, hers is the least curly in the family though so many of your hairstyles work well on her head) like your eldest! Keep up the creative blogging!